This male bust, cut down below the chest, is clad in a tunic and a pallium. The right arm is wrapped in a fold of the mantle. The man’s elongated and oval face does not face the viewer, but it is sharply turned to his left. The face is dominated by wide eyes with arched eyebrows; irises and pupils are incised. The nose is high-bridged, the lips tight with the upper one slightly jutting over the lower one. The hair consists in a minute pattern of engravings, so as to give the impression of a solid mass that follows the profile of the skull and eventually catches up with the beard. 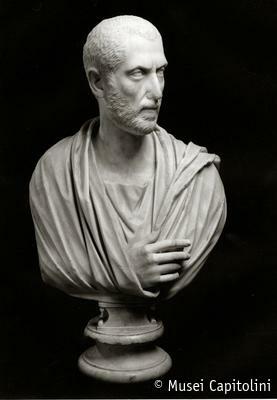 The bust, datable to the age of the emperor Gallienus, was purchased by the Capitoline Museum from the collection of cardinal Alessandro Albani in 1733.